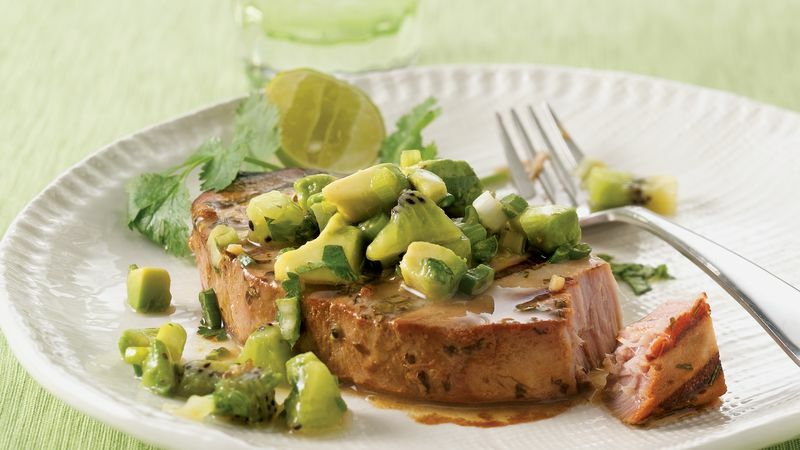 If tuna steaks are large, cut into 6 serving pieces. In shallow glass or plastic dish, mix remaining tuna ingredients. Add tuna; turn to coat with marinade. Cover; refrigerate, turning once, at least 30 minutes but no longer than 2 hours to marinate. Meanwhile, in medium bowl, mix all salsa ingredients; refrigerate. Spray grill rack with cooking spray. Heat gas or charcoal grill. Remove tuna from marinade; reserve marinade. Place tuna on grill. Cover grill; cook over medium heat 11 to 16 minutes, brushing 2 or 3 times with marinade and turning once, until tuna flakes easily with fork and is slightly pink in center. Discard any remaining marinade. Top tuna with salsa.